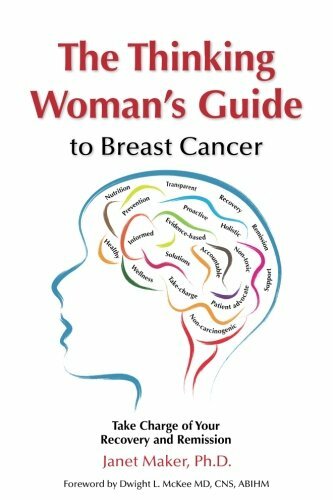 Article first published as Book Review: ‘The Thinking Woman’s Guide to Breast Cancer’ by Janet Maker, PhD on Blogcritics. “The Thinking Woman's Guide to Breast Cancer” by Janet Maker, Ph.D., depicts the author’s personal experience with breast cancer, beginning with her diagnosis, through various treatment options and procedures, the recovery process, and ongoing lifestyle choices that presented the best chances for her recovery and staying in remission. An incredible story of purpose, Maker passionately shares everything she learned along the way. Dr. Janet Maker was diagnosed with breast cancer in 2011, quite by accident actually, during a follow-up appointment for an unrelated issue. Like many people receiving such a diagnosis, she knew very little about breast cancer. She did know, however, that she wasn’t comfortable sitting idly by accepting her doctors’ advice without question. Her need to understand all of her options regarding available treatment methods, possible side effects and statistical outcomes for each, sent her on a mission to learn everything she could in order to make informed decisions about her body, and her life. To say that the author was thorough in her research and education is an understatement. Diving headfirst into the world of information, she tenaciously endeavored to overcome every obstacle one by one until she had enough information to make well-educated decisions. Readers will discover how little is actually understood about breast cancer, the general attitude of the cancer establishment and the absolute need to educate themselves in light of a diagnosis. There is also a wealth of information about the importance of a good support group, proper nutrition and complementary alternative medicine and treatments. Impressive to me is the author’s writing style and the way she conveys her message in a thorough yet concise, manner on a level that is easily understandable by the reader. Every chapter provides a substantial amount of information, ranging from receiving a diagnosis, where to find help, options about surgery, chemotherapy and radiation, hormones and recommended lifestyle changes, all of which is spelled out in an easily referenced guide. At the end of her personal story, Dr. Maker added several appendices to help readers on their own journey, such as how to find a patient advocate and integrative oncologist, how to read food labels, and keeping a health file and medical journal. Overall, I highly recommend “The Thinking Woman’s Guide to Breast Cancer” by Janet Maker, Ph.D., as a must-read book for all women. Whether there is a family history of breast cancer or not, Dr. Maker’s research and experience clearly show that breast cancer is not discriminatory, and goes far beyond genetic predisposition. This is an empowering book that provides readers with enough information to make informed choices, or at the very least, encourages them to ask more questions.